Planet Aid Thrift Center today announced that it served its 50,000th customer over the holiday weekend. The Thrift Center has been open for only nine months and has been very well received by the greater Baltimore community. Planet Aid Thrift Center's 50,000th customer. The Planet Aid Thrift Center accepts donations of lightly used clothing, accessories, shoes, books, games, home décor and more. Thousands of items are displayed at the 32,000-square-foot thrift center, all of which are for sale at a reasonable price. The proceeds from the sales support international development projects in Africa, Latin America, and Southeast Asia. In addition to the Thrift Center, Planet Aid has thousands of yellow clothing donation bins in 21 states across the continental United States. Unwanted clothing and textiles dropped into those bins are recycled and sold, and the money raised from this also funds international initiatives. The Planet Aid Thrift Center is located at 5425 Baltimore National Pike, Baltimore, Maryland 21229. Interested shoppers can sign up to receive sale notifications by email or follow the store’s Facebook page for upcoming announcements. Planet Aid is a U.S. 501 (c)(3) nonprofit and is registered with USAID as a private voluntary organization. Accredited by the Better Business Bureau's Wise Giving Alliance, Planet Aid collects and recycles used clothing and shoes as part of its environmental mission. 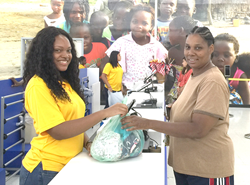 The net proceeds from its 21-state recycling operation help to support projects aimed at eliminating poverty. Since its inception in 1997, Planet Aid has provided more than $100 million to support projects on three continents. Planet Aid supports programs in education, teacher training, nutrition and agricultural and economic development.